Do Aliens Play Ball? : 13.7: Cosmos And Culture The World Cup is on, a festival of amazing teamwork and theatric tribalism. Billions of humans love soccer. Are games a mark of intelligence, something we should expect to find across the cosmos? Now that the World Cup has started, it's hard, at least for this Brazilian-born scientist, not to think about soccer. 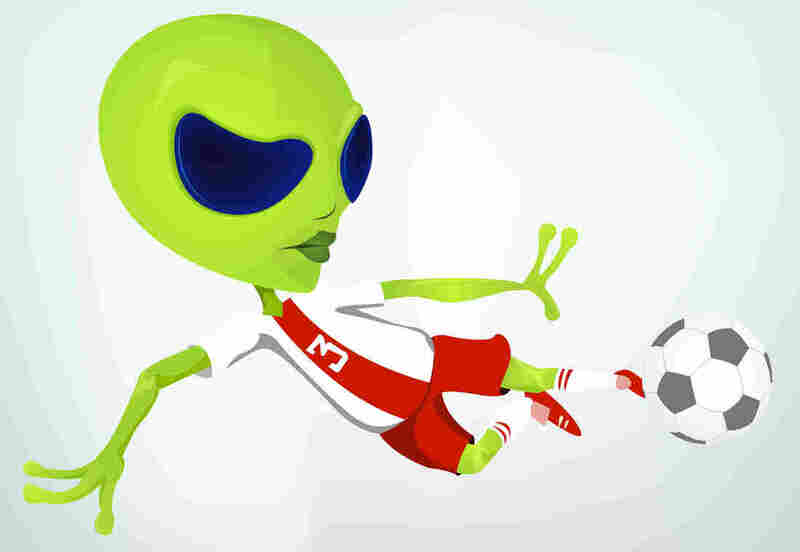 But since this is 13.7, let's consider the prospect of soccer on the galactic level by asking: Do ETs play ball? Let's suppose that there is life elsewhere and that, on at least a few planets (or moons) around the galaxy, life became intelligent. By intelligent I mean a creature with advanced cognitive ability, beyond the animals that we consider intelligent, like dolphins or chimpanzees. Animals are definitely playful, and seem to love it, as everyone who has a dog or a cat knows. But they don't invent games with specific rules. Or if they do (please supply an example), they don't reach the level of sophistication of soccer or baseball. Humans and animals dispute territory, leadership and coveted mates. Even if animals do rehearse their fighting in playful ways, they don't use a ball or split in teams with a referee for arbitration. In the case of soccer, as with most sports that use balls, the leading role goes to gravity. (After Neymar, of course.) The supporting role goes to friction. Players must deal with the effect of gravity over their bodies, for example, as they jump for a header, like the spectacular first goal from the Netherlands in their amazing win over Spain. Gravity also rules over the ball, which has the natural tendency to stay put due to inertia. Our games are fine-tuned to the gravitational and atmospheric conditions of our planet. In another place, with different gravity and atmosphere, everything changes. For example, in a world with weaker gravity, ETs would naturally have weaker muscles. As a comparison, our weight on the moon is about six times smaller than here. So, if you take people to play on the moon, their jumps will be higher and their kicks longer (weak gravity and no air friction). That's why astronauts can bounce about the moon with such ease, as this amusing video shows (wait until about 48 seconds). So, if the game is lunar soccer and the players are from Earth, the goal would have to be much bigger. For volleyball or basketball, both net and basket would have to be much higher up. Creatures evolve in tune with their worlds. In a planet with stronger gravity, creatures would need stronger muscles to move about, jump, etc. We would drag over there and they would be superhuman down here. The real question, though, is whether other intelligences would enjoy playing games. Is game-playing the trademark of advanced minds? Or is it just us, perhaps not so advanced after all? What makes us go to a stadium or stare at a screen to watch 22 people run around after a bouncing sphere? I imagine that the fun comes, at least in part, from belonging to a group, from identifying with a community, to defend its honor. And, of course, from the thrill of not knowing what will happen and hoping for the best. Our team is our tribe and during the World Cup, our country is our tribe. You know this if you watched the opening game: 70,000 Brazilians singing the national anthem in unison. It was spine-chilling. If ETs have a pulse and are any fun at all, they wouldn't miss such a chance to feel alive.